Thanks for posting those pics of the R35s. I hadn't seen any of those before. Do you know if any Polish national emblem was painted on to differentiate them French tank? Or were the French emblems covered? Andrew - this certainly sounds like an ambitious and worthwhile effort on your part. I view learning about the history surrounding our models as essential to the process. Without the historical context the objects we model have no meaning or power. If there a kit of these balloons or will you be scratching them? There are other books in the series you cited. Perhaps they might be helpful to others in this campaign? I'm not sure if there are any kits available. The plan is to scratch an observation balloon and put that in a dio while leaving room for a barrage balloon, figures and other Polish vehicles I will build in the future. If there's time I'll build a barrage balloon for the campaign. I couldn't agree more with your view on the historical aspect of our models. I'm a little behind most folks here in the knowledge of military histories but that only means I learn something every time I log in. Do you know if any Polish national emblem was painted on to differentiate them French tank? Or were the French emblems covered? In 1939 there were not national markings on Polish tanks. There were not French markings except tank registration numbers. On some Polish R-35 you can spot white circles on the sides where originally where painted French railroad markings for military equipment. Anyway meaning of them is not know. I love this picture, it shows the savagery of close quarters battle between dissimilar forces. I'm not sure who is in more danger, the horse rider or the hack rider . . . I found I have another book on the Polish campaign of 1939 that I had forgotten about. It is Polish Armor of the Blitzkrieg, New Vanguard Book 224 by Jamie Prenatt (Author) and Henry Morshead (Illustrator). I have a lot of books in this series and find them excellent primers on the subjects covered. The cover photo is of one of the R-35s in Polish service. Now I just have to find it in the stacks & heaps around here someplace . . . Thanks Marek for the info on the national symbols for the R-35s. I'm learning a lot and we're still months away from starting. This should prove to be an interesting campaign. I will be entering the Tamiya 1/35 Pz. II Polish Campaign. I have had the kit on the shelf for a while, so this is the perfect opportunity to get it built. I will post some pics once we get going. Welcome aboard Stephan. Your Panzer II is an excellent choice. The kit is a good one and there are plenty of reference materials out there should you choose to do anything outside of what Tamiya provided. I too have this kit and it looks great in the box. I'm glad to hear you are interested in doing an R-35. With a good kit, AM tracks and other goodies it will make an attractive option. The postman just brought the ABER 37mm Borfors barrel & the Airwaves PE set to gussie up the 7TP. Everything is on hand now outside of the paint. So far I have been painting my projects with Tamiya rattlecans & by brush. This project will require the airbrush, not my strong suit . . . It will be either a standalone build (that is the panzer/ crew on its own ) or a small diorama. First and Foremost, to Learn and Enable. I strive to learn, always. Where participating in discussion/ conversation via fora, I will express myself apolitically and with respect to sensitive topics and any personal opinions. I didn't even know that Bronco made a Panzer II. Is it pretty nice? I have a number of other Bronco kits but so far none have made it to the workbench. Yes it's a fairly recent (2011) new tooling, most if not all of the reviews seemed to be positive so I have one on order. As I don't have much experience in Armour (A Firefly Sherman and a pair of half tracks in 1/72 many moons ago, I was until recently relatively exclusively an aircraft modeller) it fit the bill as a nice introductory pack to learn PE and individual track link construction, so figured that I'd take the plunge. One thing I will need to source will be additional crew figures but this is to hand there are quite a few suitable early war tank crews suitable for such a vehicle. Additionally I will need to give it an identity of some sort given the inherent generic nature of the included markings. Jon - I was an aircraft modeler ad will be again at some point. This is natural for me as I have been a pilot seen I was 16. I have not flown in twenty years but miss it every day. I'm not sure how I got into building tanks, I just got interested in building some of the kits I had been buying & stowing away for years. It is sure a lot of fun! I'm looking forward to seeing your project. Three H35s were sent in July 1939 (as well as three R35s) to the Polish Bureau of Technical Studies of Armored Weapons for trials. In September, integrated in an ad hoc unit commanded by Lieutenant J. Jakubowicz, they fought hopelessly with the Dubrno task force. With kits by Bronco & Hobby Boss this opens up another good choice for this campaign. Did any of the T-35s get used in Poland 1939? I haven't seen any pictures . . . Removed by original poster on 09/16/16 - 23:06:09 (GMT). That's correct -3 or 2 H-39(depends on the sources) were in Poland. 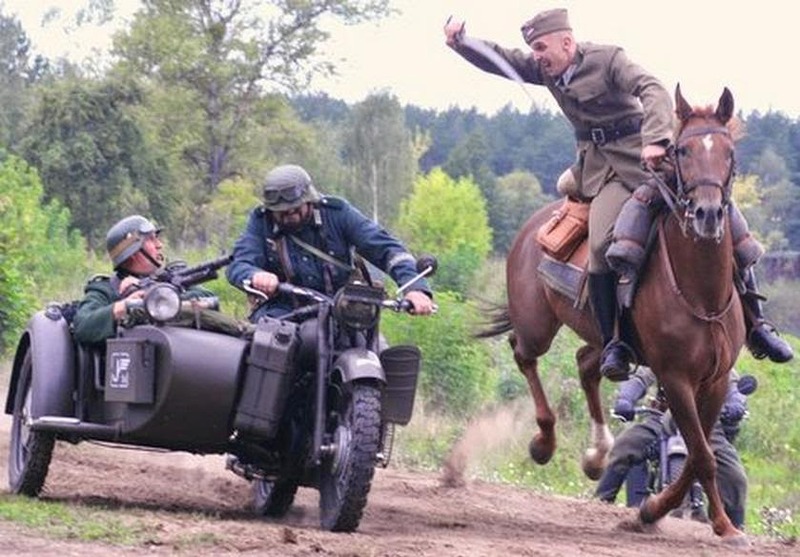 The problem there is no any photo references for Polish Hotchkiss . We might guess for our purposes here that they carried the French paint and makings as the R-35s did? Came across this -- http://www.panzerworld.com/poland-1939, while searching for AFVs that have fought in Fall Weiss. I'd say a good starting point. I'm in with a piece of artillery. Haven't locked down yet which...but leaning to a German 7.5cm Infantry Gun. The Poles just didn't have all that much in '39. Thanks Tat for this link, I found it very interesting. Have you seen a list of Soviet equipment used to match those listed for Poland & Germany? There are a number of interesting Soviet subjects that might have been used. Thanks for the cautionary note. I had not realized that the colors were not standardized. This will be important for me to delve into as I'm thinking of doing the little Hotchkiss for the Fighting Frogs campaign . . .